It is a Grayscale display of 144x24 pixels that displays information. It lives at http://ledslie.ti/ and is accessible at the space via a website and MQTT. At http://ledslie.ti/ you to submit content, such as animated GIFs, from your browser. You can publish content by posting content to the web-service. You can publish content directly to the mqtt broker that lives on ledslie.ti:1883. Symptoms: The screens network dependent screens are missing, time might be incorrect. 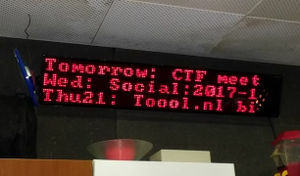 http://ledslie.ti is not available. Problem: The DHCP server was not available when Ledslie started up, and is now in network-less mode. Likely there was a space power failure. Solution: Once the network is stable again, cycle the power of Ledslie, it should restart properly. (Done-ish) Spacealert with message. Still missing working shardik code. (Done) MPD songs: What are we listening to? (Done) Maan standen. volle maan, nieuwe, etc. The led-panel takes 20V DC as input. At full output it's pulling about 4A, or about 80W. There's a small switcher-board that supplies the 5v the the getchip and Teensy from those 20V. The system's software is available at https://github.com/techinc/ledslie , this repo contains code that's running on the Display. Add another panel by adding a USB2 hub, and modding another of the led panels with the teensy taking over the driving logic. Q: What's that noise? A: The panel is being driven at rates way beyond the original design and we're well in the audible frequencies with the refresh-rates and some components are merrily humming along. Q: Why are some points brighter then others? A: Turns out that LEDs do wear. In their previous life some LEDs were on for years, while others were always off. There's plans to compensate for this in software. This page was last edited on 9 April 2018, at 17:17.